Home » Blog » My Books » Thunder Cave. Labor Day. Oprah. Thunder Cave. Labor Day. Oprah. Labor Day. Tomorrow many of you will be back in school (if you haven’t already started school). Welcome back! I hope your summer was restful. I know that mine was. I’ll be heading back to school (or schools) as well this week. A couple days ago I received this wonderful email from Ruth Sellers from Indiana about my novel Thunder Cave (a story that will always be dear to my heart because it was my first novel). Apparently, Ruth’s daughter wrote to Oprah about the book. No, Oprah did not contact me, but the letter proves that stories are powerful, and that their influence sometimes reaches far beyond the story itself. Thunder Cave has been in print since 1995 and I’m very happy to hear that it’s still being enjoyed. Thanks for the email and I certainly understand the auto-reply. I taught from your book Thunder Cave about eight years ago now. I’m sure you receive many positive responses about your books, but I want you to know about the way the book has changed my life. What follows is part of a letter my daughter wrote to Oprah. My parents are Bruce and Ruth Sellers. They live in a modest home in Goshen, Indiana, where my father works as a computer programmer and my mother as an elementary teacher. They live a similar life to most people in their late fifties, but there is something that sets them apart from many, helps to give their lives purpose, and has made me proud of them as parents and people. They are relationship makers and givers. Several years ago my mother contacted Goshen College, to see if an African student might be available to speak with her fourth grade students after they read the book Thunder Cave. 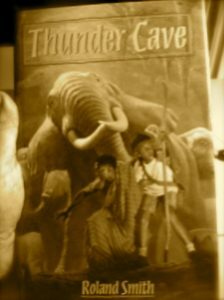 Thunder Cave includes a character from the Maasai Tribe of Kenya. By coincidence, or perhaps something greater, Elijah, a Maasai student, came to present to her school children. That experience exposed my parents to a culture an ocean away, a culture in great need of education, financial resources, and advancements in medical care. Since “Thunder Cave” many Maasai and other East African people have been supported through the generosity of my parents, their church, and community members surrounding them. Several of Elijah’s family and friends have graduated from Goshen College to become nurses. Other Kenyan Massai friends my parents have learned to know are Sitatian Kaelo, Agnes Kainet, Kisai, and Evelyn Nashipae, three incredible young Maassai women who graduated with honors from Chicago State University in May 2008, all of them pre-med students. USAID, the organization sponsoring them, originally planned to send them to graduate school to become doctors. Sitatian had already been accepted in a program for a Masters Degree in Clinical Laboratories at Rush University in Chicago, and the other girls where making plans to attend medical school, when they found out late last summer that all funding was being stopped and that USAID will no longer support them. Their story is incredible beyond words. These women have grown up walking miles to collect water for their families, cooking each meal on an open fire, and sleeping on stretched animal hide. Despite their circumstances, they have worked hard for their education and wish to use that education to give back to their communities. In our current economic crisis, it is an impossibility to raise the funds needed for them to finish graduate school from those in the Goshen community who have given much already. There was a news story about them upon their graduation from Chicago State University, before they knew that USAID was no longer offering support. For more information, review the story on the local ABC channel in Chicago. Three years ago my husband and I were privileged to travel to Kenya and Tanzania and we stayed out in a Maasai village for several days with the families we had gotten to know over the years. What a life changing experience! I hope this letter will give you inspiration to keep writing. ← Contest #3 is over. Contest #4 has commenced.